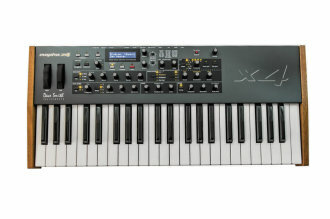 The Dave Smith Mopho x4 builds upon the same award winning voice architecture of the Mopho and Mopho Keyboard, the Mopho x4 boasts huge sound and 4 voice polyphony in an ideally sized, portable, and elegantly designed package. Use it to create huge unison basses, creamy leads, percolating sequences, and ethereal pads. Dave Smith is the only company pioneering and producing fully programmable polyphonic analog synthesizers. In fact Dave's been at it for 35 years! Designed and manufactured in San Francisco, Mopho x4 has the high quality sound and build for which Sequential is renowned. From its feature packed analog voices and unmatched sonic versatility to its refined design and engaging interface, you won't find a polyphonic analog synthesizer like this anywhere else. - Dimensions: (L x W x H) 25.2 x 11.1 x 3.6"
Available until 11 PM (EST) today. Mention special code 203-YHDB when you call.